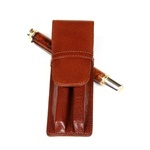 When you buy one of Lanier Pen’s handcrafted, engraved pens for your customer, employee or family member, you can select the perfect pen pouch for it. 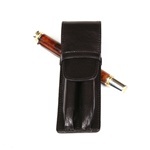 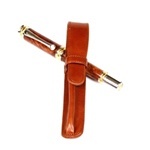 We offer a wide range of pen pouchs made out of the finest leather that will make sure the person receiving the pen or pen set can keep their exquisite writing instrument safe. 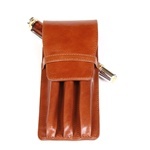 If the owner of the Lanier pen will be using the pen every day as their only writing instrument, then our leather pen pouch is the perfect solution for the single Lanier pen, or pen set. 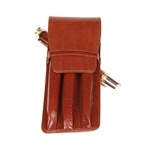 Our pen pouch is made of the finest, most durable leather. 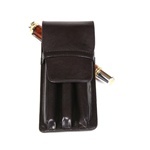 You can select from the single pen or double pen pouch in black or brown leather. 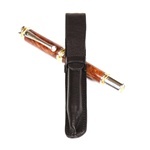 Lanier Pens knows the owner will take pride and joy in the finest writing instrument they own, and our leather pen pouch is designed to keep it safe and secure.